Patient is 63 Years old and the photo is 6 months Post Operation. A facelift removes excess loose skin and fat on your face and tightens underlying tissues. As a result, your facial contours will be smoother. It can help you look as good as you feel, and perhaps feel younger than you are. If you are considering a facelift, we want you to be thoroughly informed about the procedure. A personal consultation with Dr Newen is the best way to obtain the additional information you will need. Facelift or facial rejuvenation is one of the surgeries that can dramatically alter the aging face. Other aesthetic procedures on the face can significantly improve the appearance, but the facelift wipes away the many years that have accumulated on the aging face. This procedure is one of the most satisfying for the plastic surgeon and the patient. The patient is happy to have back the face that he or she thought has been lost to aging. The plastic surgeon is happy to see the patient happy with his or her result. The question that many patients have in my consultation is: Is it time for me to have a facelift? Implicit in this question is the conventional wisdom that facial rejuvenation is for the old and the elderly. Many patients and plastic surgeons believe that the facelift procedure should only be performed when you are really old to make the patient look less old. My philosophy on the facelift is different. I discuss with the patient that the facelift is a rejuvenation procedure but it has limits. It can reduce the signs of aging on the face from 5 to 10 years depending on the patient’s tissue. So if you are at the age of 60 the facelift can make you look about 50. But the real question is what time period in the patient’s life do they want to extend the longest. Do they want to look like they are in their 50’s for the longest or would extending the period of time they spend in their mid 30’s to mid 40’s makes more of a difference. By 45, most women will make the transition from a youthful face to a more aged appearance. By performing the facelift in the mid 40’s, a good plastic surgeon can make the patient look like she is in mid to late 30’s. Patients usually relate how their facial appearance does not reflect the youthfulness they feel inside. The aging appears so sudden that they seem to wake up one day and note that they look old. Aging is a slow and progressive process. Most people do not notice the changes from day to day but if they happen to see an old video or photograph of themselves a few years past, many will notice how significantly they have aged. The facelift procedure is usually performed under general anesthesia alone or with other ancillary procedures. It involves the removing of excess skin from the face and tightening the skin of the face with the scar hidden in front and behind the ears along the crease lines. In addition to tightening the skin most surgeons will also tighten the layer of fascia underneath the skin to improve the contour of the face and increase the longevity of the facelift. The surgery is usually performed in an outpatient setting. The recovery period can be as quick as a week or 2-3 weeks depending on the patient’s status. Most patients are extremely concerned about the overdone look of the facelift. Many can name a few celebrities that they would prefer not to look like after the surgery. I believe that the facelift can be done in such a way as to give the patient a dramatic improvement ithout any tell tale signs of surgery. Most patients with some make-up can return to work 2-3 weeks after the surgery without evidence of surgical interventions. Any surgical procedures of any magnitude have a certain amount of risks. The facelift is no different. The risks, however, is small. If the patient is a good candidate for the surgery, the benefits usually greatly outweigh the risks. I still remember something that one of my patient’s sister told me about a year ago. She said that one day she noted that her pretty younger sister no longer looked young & pretty. After the surgery, she related that the appearance of her sister was how she remembers her sister’s look to be. A facelift can improve all of these problems. It cannot correct conditions such as sagging eyebrows, excess skin and fatty deposits in the upper and lower eyelids, or wrinkles around the mouth. The conditions are addressed with other procedures that can be combined with the facelift. During the consultation, you will be asked about the results you would like to achieve from a face lift. This will help Dr. Newen to understand your expectations and determine whether they are realistically can be achieved. How will Dr. Newen evaluate me for facelift? How is the face lift performed? During the procedure, Dr Newen will make small incisions in the hairline near the ears. He will tighten the muscles underneath, remove excess skin, and trim excess fat from the jowls. He will lift the skin and soft tissue and close the incisions. Once healed, the scars will be barely noticeable. Medications are administered for your comfort during the procedure. A facelift is done under general anesthesia. It is important to realize that each individual’s recovery time will be different. You will be asked to restrict your activities and relax for a few days. Elevating your head when you sleep will help to minimize swelling and bruising. Your facial bandages will usually be removed in two days. You will notice puffiness and discoloration from bruising. Generally, the greatest amount of swelling occurs 24 to 48 hours after surgery, but it may take several weeks before all puffiness is resolved. Most bruising will disappear within two weeks. You will also experience some numbness in the facial areas, which may be present for several weeks or longer. This will depend on many variables including your heredity and lifestyle factors. Even though the aging process continues, patients are usually happy with their appearance for many years following a facelift. Significant complications from the facelift are very rare. Dr. Newen has performed thousands of facelifts, and his patients generally do not experience any major problems and are pleased with the results. Anyone considering surgery, however, should be aware of both the benefits and risks. The subject of risks and potential complications of surgery is best discussed on a personal basis during your consultation with Dr. Newen. After surgery, there may be a temporary feeling of numbness, pain, swelling, and bruising. The types of symptoms experienced and the duration of the symptoms vary in patients. The facelift is performed at Huntington Surgery Center, our outpatient surgery facility located within The Image Center. Most patients take approximately 10-14 days off to recover. Please be sure to arrange for someone to drive you home after your procedure and stay with you for at least 24 hours. 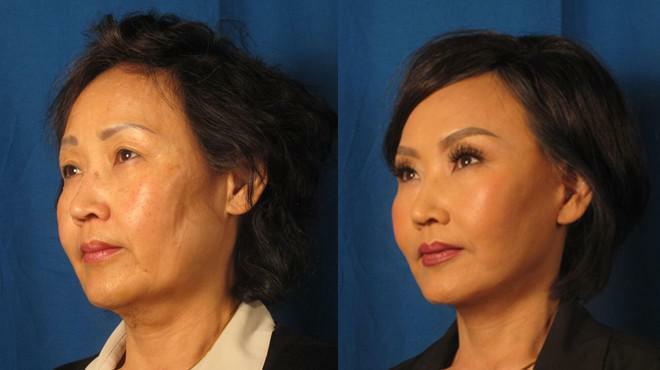 For more information on facelift or to schedule a consultation, please call our office at (714) 230-2430.